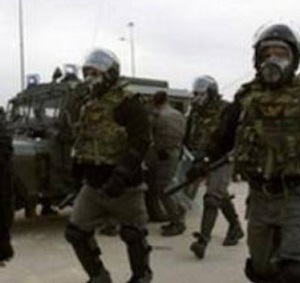 Israeli soldiers kidnapped on Tuesday, at dawn, eleven Palestinians in different parts of the occupied West Bank, and took them to a number of military bases for interrogation.Local sources in Husan town, west of Bethlehem, have reported that several armored military vehicles invaded the town, broke into a number of homes, and kidnapped two brothers identified as Amir Mohammad Hamamra, 20, and Meras, 25. Also in Bethlehem, soldiers invaded Teqoua’ town, west of the city, broke into and searched at least one home and kidnapped a Palestinian identified as Zakariyya Mohammad Sabbah, 25. In related news, Israeli army radio said the soldiers arrested eleven Palestinians, in different parts of the West Bank, adding that five Palestinians, allegedly members of the Hamas movement, have been kidnapped in the southern West Bank district of Hebron. Among the kidnapped Palestinians are Anas Hatem Qfeish, one of the sons of legislator Hatem Qfeish, Fares al-Qawasma and Ra’fat Sharabati. In related news, soldiers invaded Jenin city, in the northern part of the West Bank, and installed a roadblock on its eastern entrance. Local sources said several armored vehicles invaded Jenin city, especially the area of Jenin-Nazareth road, invaded a number of areas, including the industrial zone, and installed a roadblock near Mawwal Park. The soldiers stopped and searched dozens of cars, and interrogated several Palestinians while inspecting their ID cards.